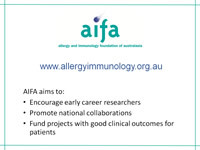 Funding for medical research into allergy and other immune diseases is critical. We need earlier diagnosis, strategies for prevention, better treatments and potential cures. AIFA provides a vehicle for corporate or personal donors, as well as philanthropic organisations, to contribute to a trustworthy fund that will enable this important future research, identified by leading experts. Our overheads are low, focused on web-based operations and marketing, which are supported by ASCIA. This means that 100% of your donation goes to the research that will make a difference. 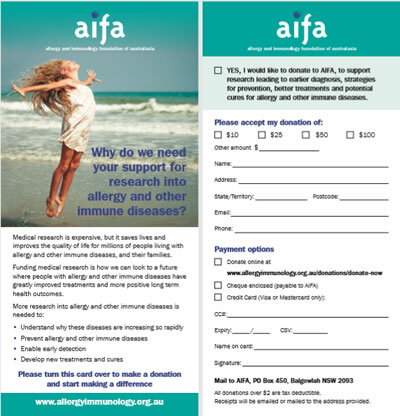 Donations of $2 or more are tax deductible, and donors of $100 or more are listed on the AIFA website, subject to permission being granted by the donor. Donations of any amount are appreciated and will help us to make a difference.